You might know him from the Mazzika and Nogoom FM show “FM TV” or the successful OTV show “حبة عسيلي” or maybe came across one of his articles in E7na magazine. 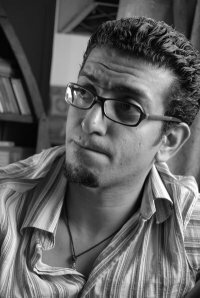 Ahmed El-Esseily graduated from the German department of the faculty of Al-Alson, he’s a film and television editor/director, a host of radio and television shows and a writer. While he can be identified by a lot of things due to the jobs he has encountered, the one thing everybody can agree on is that Ahmed is a thinker and represents the voice of sanity Egypt has been missing lately. On “Haba Esseily“, he would bring up a social issues like freedom, religion, national pride, happiness, and then mentions some examples to make the point clear, interviews some people in the street (on a couch!) about it , then summarizes people’s reactions, relates it to the issue and reality and does not give you the solution you’ve been waitng for and that was the greatest thing about the show. While we usually see TV shows on Egyptian channels telling us was what is right and what is wrong, what to do and what not to do, El-Esseily stood out of the crowd with his ways of presenting and dealing with things, specifically his great well prepared speeches. We can easily say that El-Esseily‘s strong point is his organized thinking process. On “Haba Esseily” he was just trying to lead people to a sane reasonable way of thinking so they can solve their own problems. With his natural toned speeches (and his unique distinctive voice) that reaches all levels, types and generations of people, he would get you hooked and interested in what he’s trying to say. He would also answer the questions and doubts that might be going through your head while listening to him. He just magically forces you to agree with him without actually forcing you, because you end up getting convinced by yourself. His main purpose was to lead people to think and see things in a different way that it might help them solve their own problems or inspire them to change their old ways for good. Luckily, All of the “Haba Esseily” episodes are available on the OTV website and you can find them here, go watch them, you’ll be impressed. In August 2009, his first (and hopefully not last) book was published under the name of “كتاب مالوش اسم” or “A Book Without A Name“. The book is similar to the OTV show (only on paper) and it is basically about everything in life (hence the title of the book). He just wrote down everything he’s thinking about and they all are things we do think about everyday. Each chapter in the book talks about a different subject, so it’s hard to get bored while reading it. The book had a lot of success that it ran out of print for 2 times in less than 4 months. If you’re into reading, we highly suggest picking up that book, it will make you think and wonder…(and that’s good for you). One of El-Esseily‘s habits is to change his job every once in a while, and we really hope he gets stuck in writing and presenting shows for the longest time possible. We really need sane voices, we need reasonable thinking, we need objective media and El-Esseily is offering all of these. Check out Ahmed El-Esseily‘s official Facebook page for updates.